In 1724, Dr Hermann Boerhaave described the first, and likely most well known, case of esophageal perforation. Baron Jan von Wassenaer, the Grand Admiral of Holland, followed a large meal with his customary bout of emetic-induced vomiting. However, on this occasion, the Admiral experienced a sudden and severe pain in his upper abdomen after violent but minimally productive retching. Dead less than 24 hours later, his autopsy revealed a transverse tear of his distal esophagus and gastric contents in the pleural spaces. Spontaneous esophageal rupture is a rare and dangerous entity, which today is commonly known as Boerhaave syndrome. Today, most instances of esophageal perforation are iatrogenic, but this remains a potentially devastating condition. Rapid diagnosis and therapy provide the best chance for survival; however, delay in diagnosis is common, resulting in substantial morbidity and mortality. This article discusses the causes, investigation, and initial therapy for this potentially lethal GI condition. See the image below. Nonenhanced CT scan through the mid esophagus in a patient with esophageal perforation after upper GI endoscopy shows a false tract emanating from the esophagus (arrow). The esophagus is more vulnerable than the rest of the alimentary tract due to the lack of a serosal layer, which provides stability through elastin and collagen fibers. Perforation may be due to several mechanisms, including direct piercing, shearing along the longitudinal axis, bursting from radial forces, and thinning from necrosis of the esophageal wall. Iatrogenic injury through esophageal instrumentation is the leading cause of perforation by either piercing or shearing and may be due to any number of procedures, especially endoscopy and dilatation of strictures. Such tears often occur near the pharyngoesophageal junction where the wall is weakest. Because the esophagus is surrounded by loose stromal connective tissue, the infectious and inflammatory response can disseminate easily to nearby vital organs, thereby making the esophageal perforation a medical emergency and increasing the likelihood of serious sequelae. Older age (>65 y) and underlying esophageal disease (tumor, stricture) predisposes toward perforation with instrumentation, which often occurs distal to the affected area. Perforation during surgery most often occurs in the abdominal esophagus. Spontaneous esophageal rupture (Boerhaave syndrome) occurs secondary to a sudden increase in intraluminal pressures, usually due to violent vomiting or retching, and often follows heavy food and alcohol intake. In more than 90% of cases, perforation occurs in the lower third of the esophagus; most frequently, the tear is in the left posterolateral region (90%) and may extend superiorly. The predilection for left-side perforation is due to the lack of adjacent supporting structures, thinning of the musculature in the lower esophagus, and anterior angulation of the esophagus at the left diaphragmatic crus. Fifty percent of ruptures occur in patients with gastroesophageal reflux disease, suggesting that ease of pressure transfer from the abdominal to thoracic esophagus may facilitate rupture. Shearing forces due to rapid increases in intragastric pressure against a closed pylorus result in a Mallory-Weiss tear (MWT). These longitudinal mucosal lacerations occur most commonly at the gastroesophageal junction or gastric cardia, especially if a hiatal hernia is present, and often present with hematemesis. Ultimately, these tears can perforate if the pressure increases are unrelieved. Further discussion of MWTs is reserved for another section. The cervical esophagus is the most common site of perforation by several other mechanisms as well, particularly in the region of the pyriform sinus. Trauma, almost uniformly penetrating, shows an affinity for the upper esophagus, while toxic ingestions and foreign bodies can directly damage the cervical esophagus or become lodged and cause insidious erosion of the muscle wall. Boerhaave syndrome is rare, accounting for 15% of all cases of esophageal perforation. Iatrogenic causes account for 50-75% of esophageal perforations. The actual incidence depends on the procedure; rigid endoscopy carries a perforation rate 0.1-0.4%, while that of flexible endoscopy varies from 0.01-0.06%. Rates increase quickly when interventions are undertaken, such as pneumatic balloon dilatation in achalasia (2-6%) or any procedure involving strictures secondary to radiation or tumor (15%). Furthermore, the rate of perforation is increased in the presence of a large hiatal hernia or esophageal diverticula. Penetrating trauma to the neck (2-9%), thinning of esophageal membrane secondary to variceal sclerotherapy (1-3%), and foreign body or toxic ingestions (5-15%) make up the bulk of the remaining causes. The prognosis can be poor, especially if diagnosis is delayed. Even with prompt diagnosis and definitive therapy, the hospital course may be prolonged with high rates of morbidity and mortality. The prognosis of cervical iatrogenic perforation is far better than that of spontaneous perforation. Even with prompt therapy and advances in surgical technique, the mortality rate can be very high, varying from 5-75%; higher rates correlate with delays in both presentation and diagnosis. Mortality also varies by etiology and location of the perforation. The highest rates are attributed to Boerhaave syndrome (up to 72%), partly because of the difficulty in making the diagnosis, followed by iatrogenic (19%) and traumatic perforations (7%). Cervical perforations portend a lower mortality compared with abdominal and thoracic perforations due to containment of potential contamination by tight fascial attachments and mechanisms, which may make injury more obvious. Treatment delays and misdiagnosis of the condition contribute significantly to higher rates of morbidity and mortality. Diagnostic errors are prevalent, and esophageal ruptures can be confused with equally serious conditions such as acute myocardial infarction, perforated peptic ulcers, and acute pancreatitis. The morbidity and mortality in esophageal perforation is most often due to an overwhelming inflammatory response to gastric contents in the mediastinum, pleural spaces, and adjoining tissues, as well as swift spread of infection to paraesophageal structures. Negative intrathoracic pressure may draw gastric material out of the esophagus, exacerbating injury. Morbidity may be due to pneumonia, mediastinitis, empyema, polymicrobial sepsis, and multiorgan failure. Complications include pneumonia, mediastinitis, sepsis, empyema, and adult respiratory distress syndrome. Because of improved management, a significant number of patients now survive; recurrent spontaneous ruptures of the esophagus have been described. Esophageal injuries secondary to penetrating trauma often involve adjacent structures such as the spinal cord and trachea. No information on racial predilection is available. Boerhaave syndrome is generally associated with vomiting and customarily occurs after drinking and eating binges. It is more commonly observed in males than in females. Iatrogenic perforation shows no predilection. Boerhaave syndrome is most common among patients aged 40-60 years old, but isolated case reports in children have been described. Iatrogenic perforations are associated with preexisting pathology and so are more common in fifth and later decades of life. Bernard AW, Ben-David K, Pritts T. Delayed presentation of thoracic esophageal perforation after blunt trauma. J Emerg Med. 2008 Jan. 34(1):49-53. [Medline]. Sinha R. Naclerio's V sign. Radiology. 2007 Oct. 245(1):296-7. [Medline]. Altorjay A, Kiss J, Voros A, Bohak A. Nonoperative management of esophageal perforations. Is it justified?. Ann Surg. 1997 Apr. 225(4):415-21. [Medline]. Adamek HE, Jakobs R, Dorlars D, Martin WR, Kromer MU, Riemann JF. Management of esophageal perforations after therapeutic upper gastrointestinal endoscopy. Scand J Gastroenterol. 1997 May. 32(5):411-4. [Medline]. Borotto E, Gaudric M, Danel B, et al. Risk factors of oesophageal perforation during pneumatic dilatation for achalasia. Gut. 1996 Jul. 39(1):9-12. [Medline]. Braghetto I, Rodriguez A, Csendes A, Korn O. [An update on esophageal perforation]. Rev Med Chil. 2005 Oct. 133(10):1233-41. [Medline]. [Full Text]. Brinster CJ, Singhal S, Lee L, Marshall MB, Kaiser LR, Kucharczuk JC. Evolving options in the management of esophageal perforation. Ann Thorac Surg. 2004 Apr. 77(4):1475-83. [Medline]. Chong CF. Esophageal rupture due to Sengstaken-Blakemore tube misplacement. World J Gastroenterol. 2005 Nov 7. 11(41):6563-5. [Medline]. Cordero JQ. Distal esophageal rupture after external blunt trauma: report of two cases. J Trauma. 1997. 42(2):321-322. [Medline]. Eroglu A, Can Kurkcuogu I, Karaoganogu N, Tekinbas C, Yimaz O, Basog M. Esophageal perforation: the importance of early diagnosis and primary repair. Dis Esophagus. 2004. 17(1):91-4. [Medline]. Fan Y, Song HY, Kim JH, et al. Evaluation of the incidence of esophageal complications associated with balloon dilation and their management in patients with malignant esophageal strictures. AJR Am J Roentgenol. 2012 Jan. 198(1):213-8. [Medline]. Furugaki K, Yoshida J, Hokazono K, et al. Esophageal ruptures: triage using the systemic inflammatory response syndrome score. Gen Thorac Cardiovasc Surg. 2011 Mar. 59(3):220-4. [Medline]. Gupta NM, Kaman L. Personal management of 57 consecutive patients with esophageal perforation. Am J Surg. 2004 Jan. 187(1):58-63. [Medline]. Inculet R, Clark C, Girvan D. Boerhaave's syndrome and children: a rare and unexpected combination. J Pediatr Surg. 1996 Sep. 31(9):1300-1. [Medline]. Jagminas L, Silverman RA. Boerhaave's syndrome presenting with abdominal pain and right hydropneumothorax. Am J Emerg Med. 1996 Jan. 14(1):53-6. [Medline]. Johnsson E, Lundell L, Liedman B. Sealing of esophageal perforation or ruptures with expandable metallic stents: a prospective controlled study on treatment efficacy and limitations. Dis Esophagus. 2005. 18(4):262-6. [Medline]. Kaneda T, Onoe M, Asai T. Delayed esophageal necrosis and perforation secondary to thoracic aortic rupture: a case report and review of the literature. Thorac Cardiovasc Surg. 2005 Dec. 53(6):380-2. [Medline]. Lowell M, Barsan WG. Esophageal perforation. Marx JA, ed. Rosen's Emergency Medicine: Concepts and Clinical Practice. 2005. 1237-8. Lowell M, Barsan WG. Esophageal perforation. Marx JA, ed. Rosen's Emergency Medicine: Concepts and Clinical Practice. 5th ed. C. V. Mosby; 2002. 1237-8. Lujan HJ, Lin PH, Boghossian SP, Yario RF, Tatooles CJ. Recurrent spontaneous rupture of the esophagus: an unusual late complication of Boerhaave's syndrome. Surgery. 1997 Sep. 122(3):634-6. [Medline]. Ochiai T, Hiranuma S, Takiguchi N, et al. Treatment strategy for Boerhaave's syndrome. Dis Esophagus. 2004. 17(1):98-103. [Medline]. Panieri E, Millar AJ, Rode H, et al. Iatrogenic esophageal perforation in children: patterns of injury, presentation, management, and outcome. J Pediatr Surg. 1996 Jul. 31(7):890-5. [Medline]. Ring D, Vaccaro AR, Scuderi G, Green D. Vertebral osteomyelitis after blunt traumatic esophageal rupture. Spine. 1995 Jan 1. 20(1):98-101. [Medline]. Rubesin SE, Levine MS. Radiologic diagnosis of gastrointestinal perforation. Radiol Clin North Am. 2003 Nov. 41(6):1095-115, v. [Medline]. Sabanathan S, Eng J, Richardson J. Surgical management of intrathoracic oesophageal rupture. Br J Surg. 1994 Jun. 81(6):863-5. [Medline]. Troum S, Lane CE, Dalton ML Jr. Surviving Boerhaave's syndrome without thoracotomy. Chest. 1994 Jul. 106(1):297-9. [Medline]. Vanuytsel T, Lerut T, Coosemans W, et al. Conservative management of esophageal perforations during pneumatic dilation for idiopathic esophageal achalasia. Clin Gastroenterol Hepatol. 2012 Feb. 10(2):142-9. [Medline]. Vial CM, Whyte RI. Boerhaave's syndrome: diagnosis and treatment. Surg Clin North Am. 2005 Jun. 85(3):515-24, ix. [Medline]. Prete F, Pezzolla A, Nitti P, Prete F. Laparoscopic primary repair and isoperistaltic endoluminal drain for Boerhaave's Syndrome. Ann Ital Chir. 2015 May-Jun. 86(3):261-6. [Medline]. Shen G, Chai Y, Zhang GF. Successful surgical strategy in a late case of Boerhaave's syndrome. World J Gastroenterol. 2014 Sep 21. 20(35):12696-700. [Medline]. 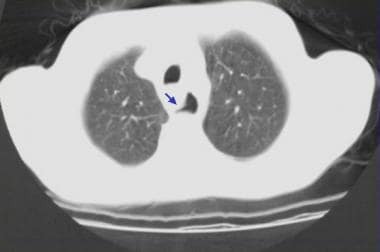 Nonenhanced CT scan through the mid esophagus in a patient with esophageal perforation after upper GI endoscopy shows leakage of oral contrast material (blue arrow) and air in the posterior mediastinum (red arrow).